If you are seeking South Calgary Dentures for yourself or a family member, the dental team at South Family Dental Care is here to help make the process as easy as possible. At South Family Dental Care, we provide superior denture solutions for patients with missing teeth. 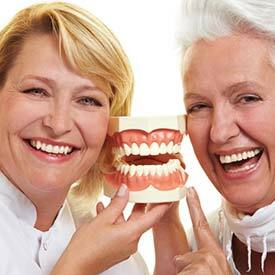 We offer traditional, immediate, partial dentures, as well as denture relines. Dentures are replacements for missing teeth that can be removed and put back into your mouth. A denture consists of a plate or frame holding one or more artificial teeth in place. Dentures can take some getting used to, and while they may never feel the same as your original teeth, they can look natural and are now more comfortable than ever. At South Family Dental Care, we will advise you of all treatment options available based on your unique case. Is there any Alternative to Dentures? We invite you to book an appointment to learn more about South Calgary Dentures. Our team of dental professionals looks forward to the opportunity to meet all of your denture needs. Call us at (403) 262-3235 to book your Calgary Dentures Consultation with us today!